The project was organized by the Boston Globe’s editorial staff, who contacted editorial boards around the U.S. and asked if they’d contribute to the effort to combat Trump’s criticism. "Today in the United States we have a president who has created a mantra that members of the media who do not blatantly support the policies of the current US administration are the ‘enemy of the people,’" the Globe wrote. "This is one of the many lies that have been thrown out by this president." Media outlets who participated in the efforts include the New York Times, the Chicago Tribune, the New Yorker, the St. Louis Post-Dispatch, and hundreds of other publications ranging from national to local outlets. "Insisting that truths you don’t like are ‘fake news’ is dangerous to the lifeblood of democracy," the New York Times’ editorial board wrote in a column. "And calling journalists the ‘enemy of the people’ is dangerous, period." The St. Louis Post-Dispatch noted "Trump is inflicting massive, and perhaps irreparable, damage to democracy with these attacks." 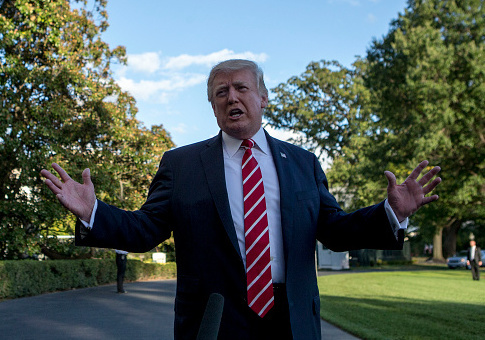 Trump has frequently lashed out over the news media’s negative coverage of him, tweeting seven times since the beginning of June that the media is the "enemy of the people." The president responded to the Globe’s endeavor in a tweet Thursday morning. "THE FAKE NEWS MEDIA IS THE OPPOSITION PARTY," he wrote. "It is very bad for our Great Country." An hour later, he added, "There is nothing that I would want more for our Country than true FREEDOM OF THE PRESS. The fact is that the Press is FREE to write and say anything it wants, but much of what it says is FAKE NEWS, pushing a political agenda or just plain trying to hurt people. HONESTY WINS!" Despite some news outlets’ efforts to counter Trump’s criticisms, other publications stood in defense of the president. A Slidell, La., newspaper published an editorial in coordination with the mass condemnation of other news outlets, but the paper was highly critical of the efforts to counter Trump. "The national media still doesn’t know what to do with President Trump, so now they are crying to the American people about the names they have been called," the Slidell Independent wrote. "Maybe if they focused on doing their jobs instead of worrying about their precious reputation the American people might start getting real, honest journalism again." Politico reporter Jack Shafer said the project "will provide Trump with circumstantial evidence of the existence of a national press cabal that has been convened solely to oppose him." In early August, CNN White House correspondent Jim Acosta feuded with White House press secretary Sarah Huckabee Sanders because she would not fulfill his repeated request and state the press is not the enemy of the people. "I think the president has made his position known," Sanders told the room of reporters. "It’s ironic, Jim, that not only you and the media attack the president for his rhetoric when they frequently lower the level of conversation in this country." This entry was posted in Politics and tagged Boston Globe, Media, New York Times, President Trump, Sarah Sanders, White House. Bookmark the permalink.